Football stars of tomorrow will today come together to show off their sporting skills as the seventh Al Kass International Cup gets underway at Aspire Zone. The annual tournament brings together 12 top Under-17 (U17) teams from around the world for the eleven-day football competition. 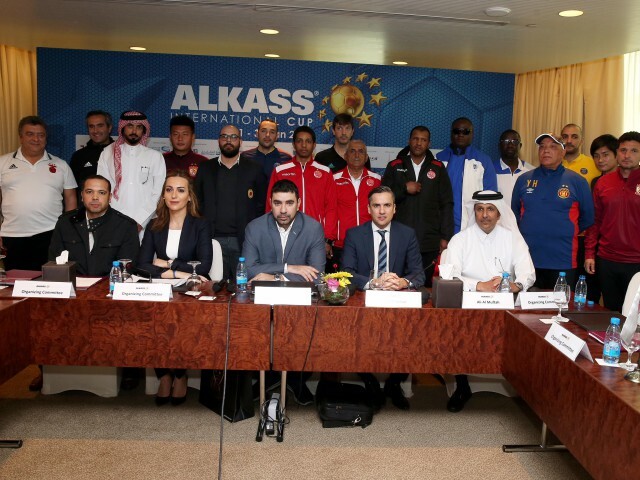 The Technical meeting with officials from all 12 teams took place yesterday Saturday 20th January at The Torch hotel, one of the two official accommodation hotels for the tournament with the other one being, Movenpick Al Aziziya Doha. Qatar’s Aspire Academy will add local flavour to the tournament, which was last year won by Real Madrid (Spain), who are once again competing for the title. Other participating teams include AC Milan (Italy), Aspire Football Dreams (Qatar), Espérance de Tunis (Tunisia), Fenerbahçe S.K (Turkey), Guangzhou Evergrande (China), Kashiwa Reysol (Japan), Paris Saint Germain F.C (France), SL Benfica (Portugal), Tottenham Hotspur F.C (England), and Wydad AC (Morocco). Mr Ward Abdullah member of the Organising Committee of Al Kass International Cup and tournament Media Director, said: “We are honoured to welcome some of the world’s top youth teams to Qatar to compete in the seventh Al Kass International Cup – a tournament that grants young players an opportunity to showcase and enhance their football skills. “Co-hosting this competition promotes international collaboration with leading clubs, and highlights the spirit of the game amongst aspiring football stars in Qatar, who are encouraged to pursue their sporting dreams,” said Mr Abdallah. Meanwhile Portuguese club side, Benfica are back in the tournament after last year’s absence and boast fourteen (14) players in their squad who are in their age group national team. Filipe Alves Benfica U-17 team manager called Al Kass International Cup the best of the forty (40) youth football tournaments across all age groups that the club plays in. “We have brought to this year’s competition the finest of the youth teams we currently have at Benfica and with the likes of Real Madrid, Aspire Football Dreams PSG and AC Milan we expect a very competitive tournament and we will battle hard for honours against some of the teams in the world,” remarked Mr Alves. In the first match of the tournament, which kicks off later today, defending champions Real Madrid will go up against new competitors for the title, Fenerbahçe S.K, before Guangzhou Evergrande go head-to-head with SL Benfica in the second match of the day. In the final match of the day, Esperance de Tunis will take on Wydad AC. The first round of the tournament will pit groups of three teams against each other in a round-robin competition, with the top two teams from each group advancing to the knockout round. The final will be held on 31 January. Aspire Academy’s U17 team kicks of its campaign in Group A of the tournament with an encounter against Guangzhou on Monday, January 22, at 5:35pm on Aspire pitch 4 before taking on Benfica on Wednesday, January 24, at 5:35pm on Aspire pitch 4. This year Spanish coach, Unai Melgosa Zorrilla is in charge of the abundant Qatari talent under his tutelage and ahead of the tournament he spoke of the integral part this competition plays in the Academy’s ultimate goal which is to develop its players to be competent and competitive at the highest level of the game. Coach Zorrilla and his charges spent a month of preparation in Cyprus and upon return to Doha engaged Greek club side Olympiacos twice in friendly matches. The Al Kass International Cup is among top tournaments world over and it is very important to us. It gives us the opportunity to assess and compare ourselves with other teams, to evaluate our training process. We are in the tournament to compete, but we are also aware of the expectations on us especially in the light of last year’s fantastic run. Our main focus is to play as best as we can, bringing into our play aspects of the game we have been working on. This is a new team and one that is learning and improving and the tournament is a good chance to get a realistic assessment of the progress we have made so far as a team. It is also about dealing with the environment, the media, staying together in the hotel during the tournament”, says coach Zorilla, who joined Aspire in 2017 and also doubles as Mentor Coach to fellow coaches. He previously worked for the youth departments of Athletic Bilbao and FC Malaga, before coaching the U19 and second team of Dynamo Kiev. Currently celebrating its seventh year, Al Kass International Cup is organised by Al Kass Sports Channels, in collaboration with Aspire Zone Foundation and the Qatar Football Association. The Under-17 football tournament is a global championship for worldwide competitive clubs. Inaugurated in 2012, Al Kass International Cup is an annual tournament that provides some of the world’s choice young footballers the opportunity to demonstrate their ability and skills on the world stage. The tournament also aims to contribute to the nurturing of passion for football in Qatar and the region by offering up an 11-day action-packed competition that seeks to propel Qatar to the forefront of sporting excellence and leadership.